The sport is getting a bad reputation in other ways. To be maintained properly, golf courses have to be watered regularly – this, at a time when northern China is suffering from chronic water shortages. And building new ones means expropriating farmland, often under highly dubious circumstances – this at a time when the most heavily populated country on the planet strives daily to maintain enough arable land to feed its people. 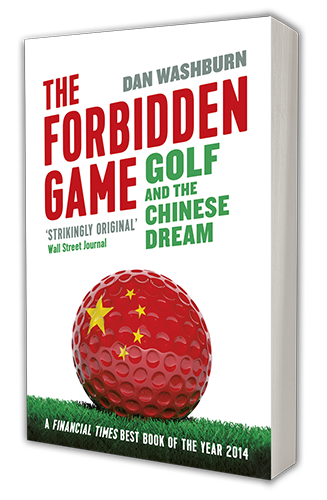 In March, China’s national development and reform commission, the state’s central planning office, announced the closure of 66 golf clubs – about one out of every 10 in the country, according to American journalist Dan Washburn, author of The Forbidden Game: Golf and the Chinese Dream . That’s a rough estimate, he admits: “Nobody knows the exact number of golf clubs in China – it’s somewhere between 600 and 1,000.” The Chinese government ordered a stop to new construction in 2004, but the number of clubs has tripled since then in other guises, lumped in with acceptable projects such as protected nature reserves. Filed under Blog, Featured. Tagged media, press, the guardian.